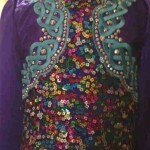 This Beautiful Purple Crystal Satin and Sequined Champ Dress suits 12-14 year old dancer. 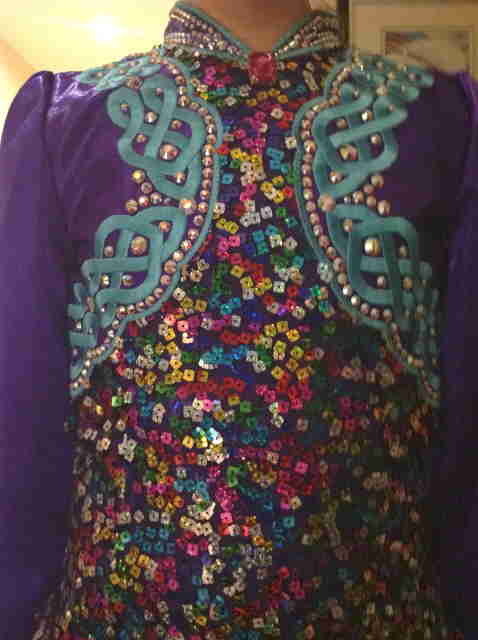 It has bold turquoise embroidery, $400 in Swarovski crystals. Was new for 2012 NANs. Daughter has grown 4 inches. 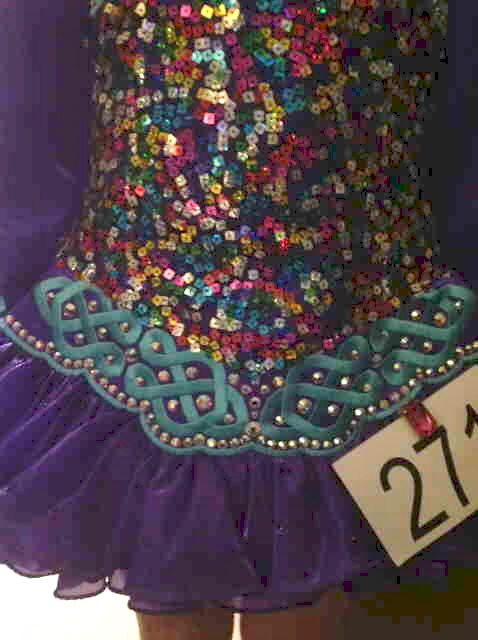 Dress made when dancer was U12 approx 4’10”, weighed 87 LBS when made and now 5’2” and 94 LBS. Room to let out and down. Like new condition, $1300 OBO. 1. Finished Length Front-27-30”: Measure from center of collarbone to bottom of skirt. 5. Chest-31”: Measure around the widest part of the chest/bust. 14. ¬¬¬¬¬¬¬¬¬¬¬¬¬¬¬¬¬Sleeve Under Arm-17”: Measure underarm sleeve seam down past the wrist to middle of the back of the palm approximately level with the thumb knuckle. 15. 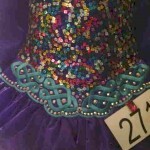 Finished Length Back-27-30”: Measure from base of neck to bottom of skirt. Several inches to let down at dropped waist. 3/4″ on each side to let out, sleeves can be let down. Asking Price: $US1300. Return are negotiable.